You are not a hero. That, Dragon Quest Builders wants to make clear. That may be because they don’t have a great track record at the moment, seeing as generations earlier the hero that was destined to slay the evil Dragonlord instead fell victim to his trap. That single, foolish choice has since plunged the realm of Alefgard into darkness, and wrenched the power to create from the world’s people. That’s where you come in. After selecting your character’s gender, hair, skin, and eye colour to then give them a name, Rubiss, the spirit of the land, wakes you from a long slumber in your tomb. With no recollection as to who or what you are, this brief, pun-packed tutorial reveals the plight of the world and the role that you are destined to play in saving it. As the legendary Builder, you must use the power of creation that dwells within you to rebuild the ruined world however you wish – the dreams, hopes, and fates of the world’s people resting on your shoulders. Dragon Quest Builders swaps out turn-based battle mechanics and courageous party members for the godly power of creation. It is a block-based world that you explore, and your character can break everything apart to reduce them to raw materials that can be combined to create new items. That power is shared by none other in Alefgard, with even its existence now revered as a legend. Once you eventually emerge from your tomb, you learn that your first task is to rebuild the once bustling city of Cantlin. Planting the Banner of Hope at its location, the area around it becomes your base. From here, the general idea is that you start to rebuild, whether that be rooms, fortifications, or decorative items. These all contribute to the base’s level and, as it levels up, dishevelled survivors will flock to your city for protection and to help out. Seeing as they have all lost the power to create, it falls to you to do most of the work, of course. While you are always free to do whatever you like whenever you play, the chaptered story in Dragon Quest Builders is largely objective-based thanks to quests. And, as someone that didn’t become as addicted to Minecraft: Nintendo Switch Edition as the rest of the world, that approach soon saw me sink many more hours into saving Alefgard. There are light role-playing elements that underpin the game, but it’s really all about unleashing your creativity. The angry monsters that maraud the map (which includes the ever cheerful Slime) will swipe at you on sight, meaning that you will need to create healing items to restore your health when needed. There’s also your hunger to consider, which depletes over time and can see your health start to deplete if your character isn’t given something to munch on quickly enough. And, while there’s no character levelling system, players are rewarded with Seeds of Life that permanently raises their health, while stronger weapons and armour can be created once you have the chance to collect sturdier materials. The people that take residence in your town will make their requests known, thanks to exclamation marks over their heads. These can either be diversionary side quests or those that progress the story forever onward, starting with rebuilding a bedroom and will soon see you warping through portals to hunt out stranded survivors and new materials. It is in the discovery of a new material that Dragon Quest Builders can be particularly exciting, your character miraculously remembering ways in which it can be used to create new items at a crafting station mere seconds after picking it up. Without ever coming to the realisation, this is how Square Enix subconsciously hooks you in – to the point where you will happily while away your hours with the game. Set off to gather materials, return to craft items and build rooms, repeat. It’s a harmonious gameplay loop that drives the experience, even if it risks becoming slightly tedious in lengthier sessions. I’d even go as far as to say that everything that Dragon Quest Builders has set out to achieve works well. The material collection is quick, especially once you learn the spin attack. Then, building is just as fast, seeing how quickly players can place blocks in stacks of two next to each other. And, the quest structure means that you are never left meandering about. That’s not to say that the game is ever overly simplistic or never becomes more complex. There’s the fact that certain materials can only be collected with particular weapons, that items will soon require multiple materials to create, and that once you rebuild Cantlin and move on to the next chapters more materials and complex scenarios are thrown in your direction. But Dragon Quest Builders always remains accessible, and that’s important for those that are willing to learn the game’s many intricacies. There are ways that Square Enix looks to help. The rooms that you create must have walls that are at least two blocks high, a door and a light source, and the player is handed blueprints as a guideline to create more elaboration constructions. The materials that you gather can be placed in treasure chests, and, regardless of whether your character is carrying them, can be used in crafting and accessed from any location. That’s easily the smartest and handiest idea that the game has. It’s combat that can be seen as an Achilles heel in Dragon Quest Builders though, not that I can really offer any ideas on better ways that it could be approached. The assorted weapons (such as sticks, swords and hammers) that you use to gather materials can be mercilessly swung at the monsters that attack you, while they swipe back. Wipe their health and they’ll disappear in a puff of smoke and may leave behind a material. The boss battles, which are certainly more epic in scale, similarly feel at odds with the game’s greater desire to tap into your creativity. Those that want to simply enjoy Dragon Quest Builders without the overarching story should know about Terra Incognita. This is a place that’s closer to the realm of the spirits and away from Alefgard, and therefore where the Dragonlord’s evil influence cannot reach. Moving away from the theatrics, it’s a place where you can build to your heart’s content with access to unlimited resources. However, it’s best to play this after you have completed the game, seeing as portals will open up to lands that you have freed from darkness. It’s worth mentioning the energetic Great Sabrecub that, once found growling at a group of monsters, you can ride in this mode, which is exclusive to the Nintendo Switch version – helping you roam your surroundings faster. There are also some great ideas in Terra Incognita such as the Sharing Stone, which can be placed around anything that you have created to share it with other players online. 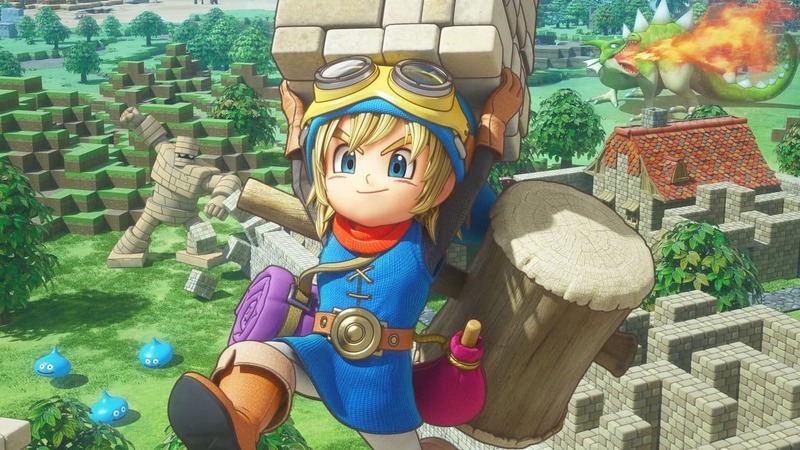 Dragon Quest Builders still remains a single-player game though, although we know that multiplayer has been added in Dragon Quest Builders 2. The game’s performance on Nintendo Switch is consistent which most will be happy to hear, although, when docked in TV mode, the graphical fidelity is certainly less crisp than on PlayStation 4. However, that becomes less noticeable in Handheld mode, where the lower resolution makes this far less of a problem, and, for me at least, was the perfect way to experience the game. If there is one area that more strongly disappoints it’s the soundtrack from long-time Dragon Quest series composer Koichi Sugiyama, whose melodies for this game never really feel remarkable enough to be memorable. Dragon Quest Builders is a game that more than deserves your attention on Nintendo Switch. Your character may not be a hero, but the chance to rebuild ruined towns is not only brilliantly executed, but lends a sense of accomplishment that other games in the genre haven’t achieved as successfully. For once, we can leave more obvious heroics to one side and bask in our creative wonder.